This is one of my favorite go-to lunches when I’m keeping semi-raw during the day. It’s so fun to add different shaved vegetables and fermented veggies with a variety of sauces to keep things interesting! Feel free to get creative! On a flat surface, place nori sheet. Spread a smear of the spicy sauce on the bottom of the nori sheet. 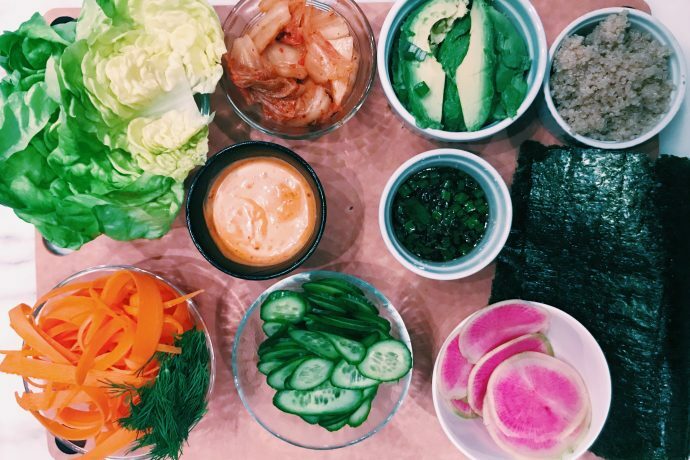 Follow with a small handful of the shaved romaine or 2 Boston lettuce leaves, then a few slices of cucumber, radish, carrot, kimchi and 2 sliced of avocado. Carefully roll upwards, tucking as you go to form a handroll. Using a sharp knife, slice in half. Dip in tamari scallion sauce and enjoy!